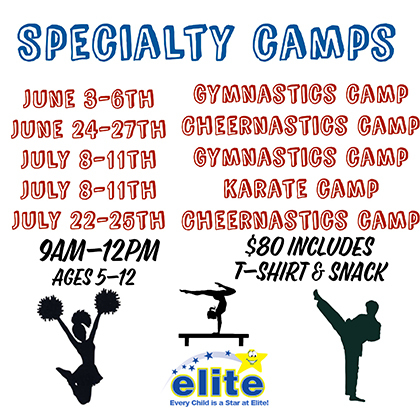 Sandersville: 313 E. McCarty St.
All camps will be from 9AM to 12PM of the day it occurs. We will call for payment after your form has been submitted. I hereby authorize Elite School LLC to act for me according to their best judgement in any emergency requiring medical attention. The undersigned hereby acknowledges that participation in recreational programs involves inherent risk of physical injury, catastrophic injury, or even death. The undersigned assumes all such risks and agrees to waive and release Elite School LLC, its owners, employees, and affiliates from any liability for injuries or death incurred while involved in a program on or off the premises. The undersigned also assumes all medical costs incurred as a result of such an accident. This waiver is also applicable to any transportation in the Elite vans. Please type the following. This will serve as your digital signature. We will call you for payment. © 2019 Elite Gym USA. Georgia Web Design by Goebel Media.